The Instant Pot and 15 minutes is ALL you need to get a bottle of Liquid Gold in your kitchen. 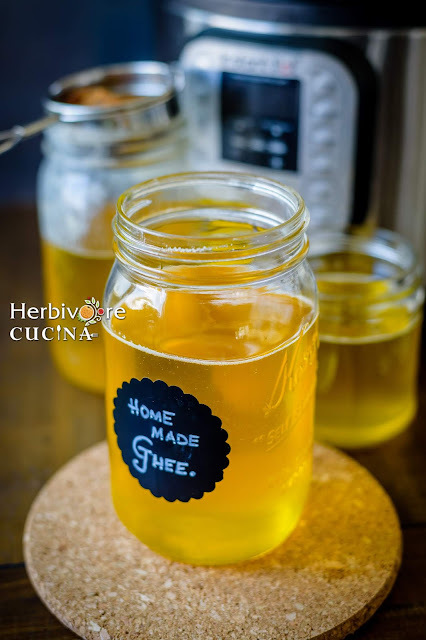 Follow this method to make ghee at home! Have you tried making ghee at home? The liquid gold of the kitchen pantry that makes Indian food even better! If you have not tried it yet, here is a post to make sure you make it at home ALL THE TIME! Making ghee may sound like a daunting task if you start it from churning cream. That is the method my mother used years ago. Then it was simplified by using Unsalted butter off the rack and making it on stovetop. And now with the Instant Pot, it is SO SIMPLE. I have been making ghee for the last few years. It takes a few minutes but I make it so that it lasts me a couple of months. 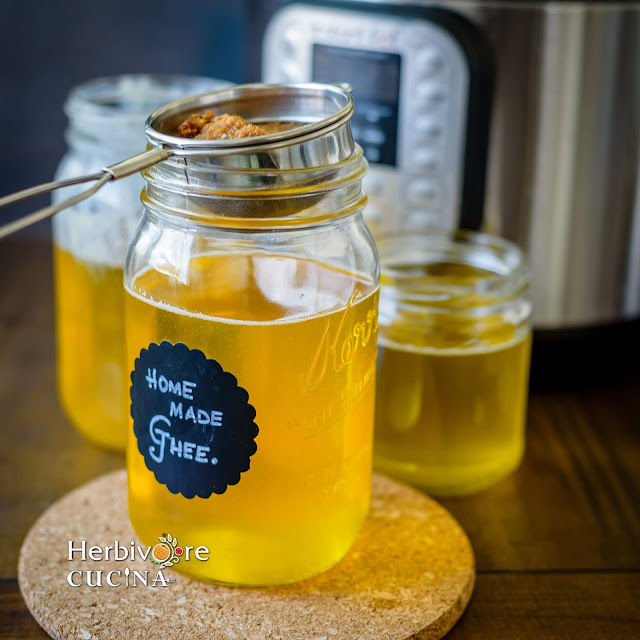 Since I got the Instant Pot I started using that to make ghee and now it is so easy to make it. With no fear of burning it or not cooking it enough, this version is my favorite way. 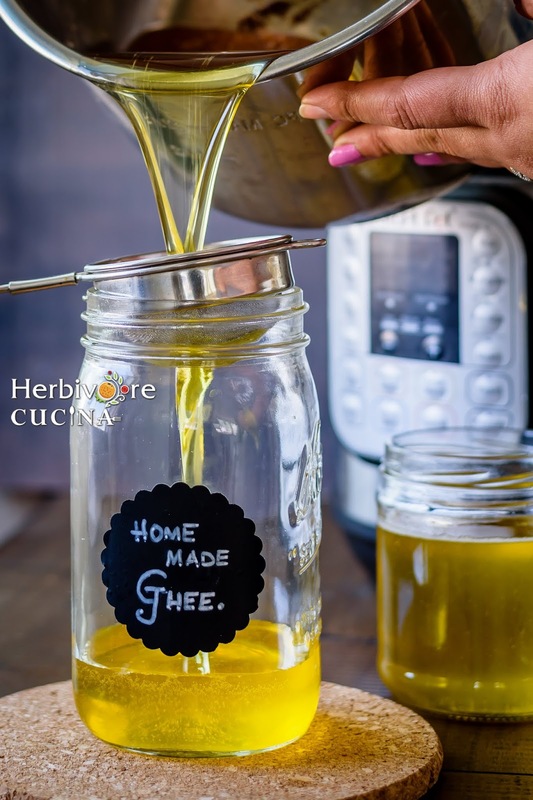 An ingredient that is widely used in Indian cooking, ghee can easily be bought from any Indian store. However, it is really simple to make it at home. Plus, with a long shelf life, you can make a big bottle and consume it for DAYS. No need to refrigerate ghee as it is great at room temperature. Just make sure it is in a clean jar to avoid contamination. When you heat unsalted butter, it starts to boil and turn transparent. The milk solids separate and this is the stage that clarified butter is obtained. Once clarified butter is obtained, it has to be boiled further till the milk solids turn brown and settle at the bottom of the pan. This gives out a nutty flavor and smell. That is the stage that you know that ghee has been made! As I mentioned above, ghee finds uses in tempering various dals, rice, curries and more. Plus an important ingredient in many Indian sweets, ghee is rightly called liquid gold of the kitchen pantry. I have been making ghee with just unsalted butter since the time I started making it at home. However, my mom was here this summer and told me to add a pinch of salt to the ghee. It changes the texture from a smooth paste to granular ghee. I have been using that method now and there is no looking back. If you want, you can add salt or leave it out. The unsalted butter from the store works well with the recipe. Use organic or grass fed or regular unsalted butter. The method remains the same for all kinds of butter. I use the Organic butter from Costco or Kerry Gold Butter. They work equally well for me. With all this information, it is time to check out the recipe of ghee using the Instant Pot. 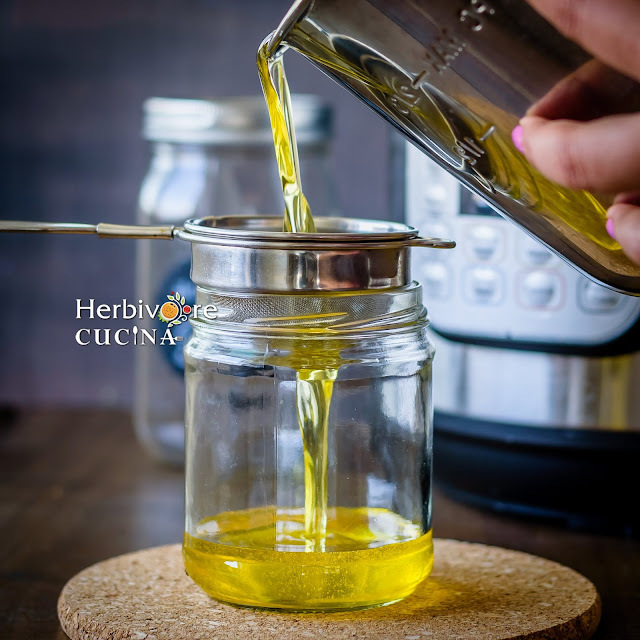 If you would like to try the stove-top version, find it here: Stove-top method to make Ghee. Thaw the butter for a couple of hours. This step is not mandatory, only to make ghee faster. Set the Instant Pot mode to sauté, adjust to normal and set timer to 10 minutes. Add the unsalted butter and let it melt. 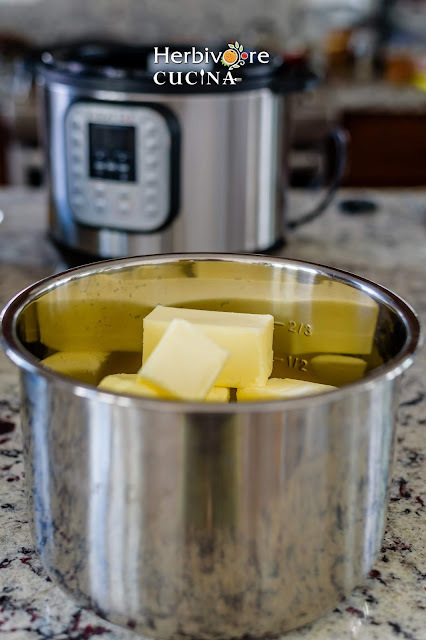 In about 5-6 minutes the butter will melt completely and start bubbling. The residue will settle at the bottom and the top will become clear slowly. Once the top is clear, shut off the Instant Pot. Add a pinch of salt (if using) and mix well. Though the pot is off, the heat is enough to make the residue turn dark brown and settle. So do not remove the insert yet. 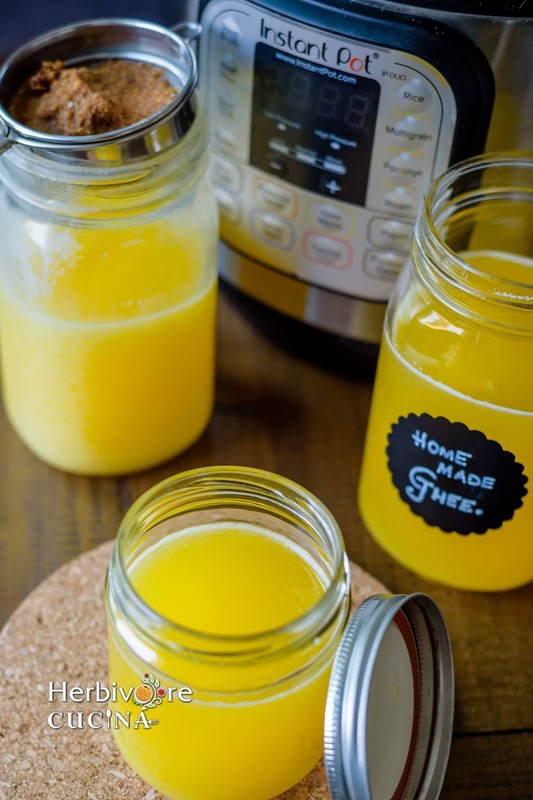 Let the ghee cool in the Instant Pot insert and transfer to a clean bottle through a fine mesh strainer. Cover and store at room temperature. 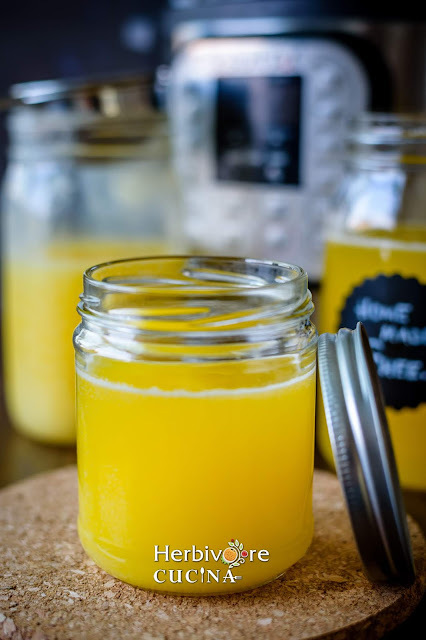 The ghee can be refrigerated too (though not required). 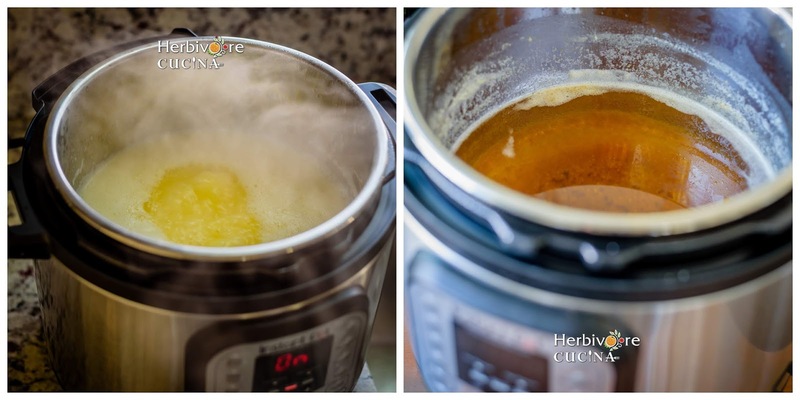 Wow Shruti, that's a really clever idea to make ghee in an instant cooker. I don't have one though. And the ghee looks so soothing...process is beautifully explained !! I do like to make ghee at home too so can imagine the joy of making it. Happy cooking !! Thanks a lot! You must get one if you plan to! It is amazing for many recipes. As for the ghee, I LOVE making it at home as I know exactly whet is in it! Happy cooking to you too! Wow...the ghee look so good. I will try it too. Thanks a lot!!! Hope u try it soon! I am sure you will love it!